Revolution Groove: Ryan Harvey Live! 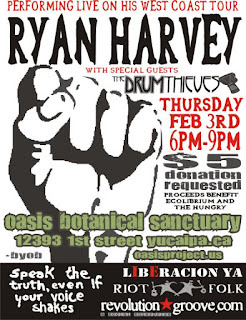 Baltimore, Maryland's Ryan Harvey is a musician, writer, activist, organizer and social change artist. 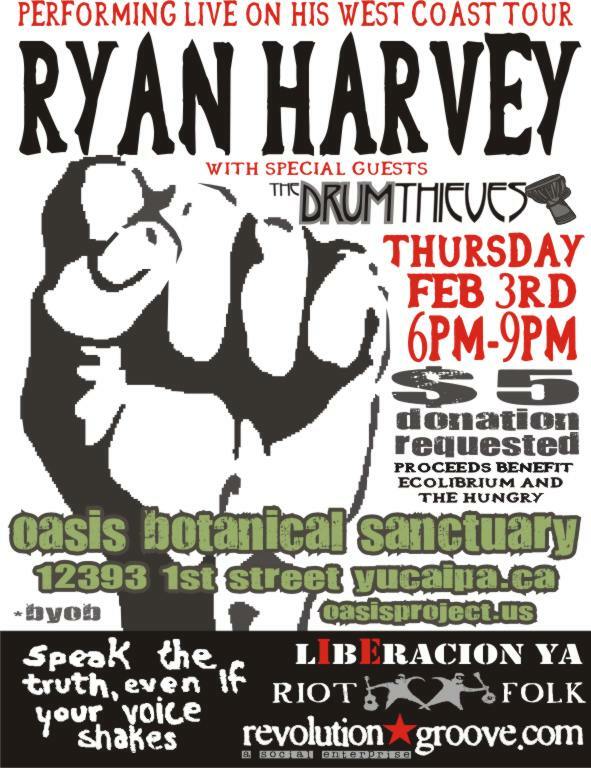 This Thursday February 3rd the beautiful Oasis Botanical Sanctuary in Yucaipa will host one of his SoCal tour stops. Ryan's truth and conscience filled acoustic folk rock style speaks volumes of the world we live in. Come enjoy an evening of thought provoking inspiration! In other stops along this West Coast swing of his tour, he'll be taking the stage with members of Stiff Little Fingers as well as Rage Against the Machine's Tom Morello. Local rockers The Drum Thieves and Revolution Groove DJ's are also on the bill. We apologize for the short notice, but when Revolution calls it is our duty! We are honored to have Ryan hang with us and we hope you join us! Peace.